A skin allergy can result from anything inhaled, ingested, injected or applied to the skin. Exposure to an allergen can cause skin allergic dermatitis, but some allergens may also lead to a more severe systemic allergic reaction, depending on your immune system's response. In a severe allergic reaction beyond the skin, you can have difficulty breathing or go into anaphylactic shock and unconsciousness. It is not uncommon to develop an earlobe allergy to the needle or the earring inserted after the ear piercing, or an allergic reaction elsewhere after any other body piercing. Titanium should be used for all piercings if you have any allergies to metals. To avoid these allergens elsewhere, look for items made of plastic or coated metals. Unscented does not mean fragrance free; they often use another chemical related to Balsam of Peru (another common allergen) to block the scent. Look for fragrance-free products to avoid these allergens. Avoid products with Thimerosol if you have an allergic reaction any of these items. Reactions can range from a skin rash to burning eyes, throat and nose symptoms, or shortness of breath. Use formaldehyde-free products if you develop and allergy to the above products. This includes avoiding wrinkle-free clothes. However, washing your clothes repeatedly in hot water can often reduce the formaldehyde exposure from the fabric finishes on your clothes. An allergic skin reaction to Balsam of Peru is usually an itchy red rash. Avoid food flavorings, processed foods, and any product with Balsam of Peru as an ingredient. It can cause a typical red rash with fine bumps at the contact area. In the eye it can cause itching, redness and tearing. In the ear there can be itching, pain and fluid drainage. Rarely topical Neomycin can cause a more systemic reaction. To avoid exposure to this allergen, read ingredients and product labels carefully and consider wearing gloves when handling pet foods. Inform your doctor of this allergy before he prescribes eye or ear drops or other preparations containing this ingredient. Permanent, demi-permanent and semi-permanent hair dyes. Darker hair colors have increasingly more PPD added than lighter colors. 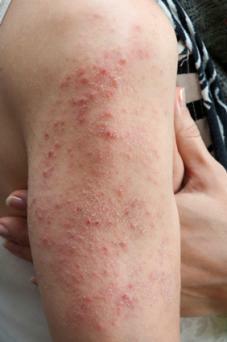 The allergic contact dermatitis can be a mild, red itchy rash at the site. A more severe reaction can occur with swelling and oozing bumps at the contact area. With hair dyes, the severe reaction can lead to swelling and oozing of the scalp and swelling of the face, eyes, and neck. It can also lead to hair loss. Hair dye allergy can also result in a full-blown systemic allergic reaction, including difficulty breathing and, occasionally, anaphylaxis. To avoid exposure, use PPD-free hair coloring products or avoid darker hair dyes. Elumen Hair Color (Goldwell Cosmetics, Linthicum Heights, MD) is a PPD-free hair color that comes in multiple shades and last 4-6 weeks. If you are allergic to PPD, you should also avoid black henna tattoos as well as contact with printer and photocopy inks and black rubber products. It is also advisable to avoid textiles dyed with PPD-containing dyes, especially darker colors. A rash occurs at the point of contact. Some people, however, can get itchy eyes and have difficulty breathing and anaphylaxis. Use latex-free gloves and condoms and avoid other items on this list that are made with latex. Symptoms include a rash, itching, redness, swelling and blisters on the skin. Look for cobalt chloride-free products and wear plastic or fabric-covered clothes and belt fasteners. Critically read the labels of these products to avoid contact. Poison ivy, poison oak and poison sumac contain the same allergen, urushiol. Reaction is usually an allergic dermatitis or oozing blisters at the point of contact. Some people may get a more generalized rash and fever. Avoid walking in the woods or coming in contact with pets who were in the woods if you are allergic to these plants. The red rash often resembles a sunburn on sun-exposed areas. Look for sunscreen products without the above ingredients and, if possible, avoid oral medications which cause you to have a rash when in the sun. If you need to take these medicines, stay out of the sun while you are using them. Some allergens cause a reaction on first contact, others require repeated contact. If you believe you have an allergy to a product read the label to see if it contains any substances on this list. If you have a severe reaction, repeated reactions, or multiple allergies see your primary care doctor, a dermatologist or an allergy specialist for allergy testing.